KD-S2x1X and KD-S4x1X boast 18G bandwidth and target ease of integration for soundbars. Key Digital has introduced the KD-S2x1X and KD-S4x1X 4K/18G HDMI switchers. KD-S2x1X and KD-S4x1X feature push button and optical IR switching, status-monitoring LEDs, and support of HDR10, HDCP 2.2, and 4K. These switchers boast UHD/4K support of 4096×2160 or 3840×2160 24/25/30/60 Hz at 4:4:4 (signals up to 18 Gbps bandwidth). 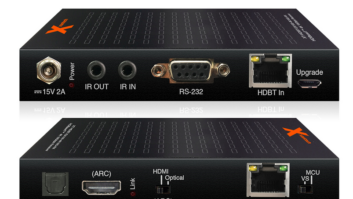 Designed for professional audio-video installations in presentation, theater, and gaming spaces, KD-S2x1X and KD-S4x1X enable multiple video sources to connect to a single video display while L/R analog and TOSlink Optical audio de-embed ports may be used to feed audio of the selected source into amplifiers, DSPs, or soundbars. Key Digital’s KD-S2x1X and KD-S4x1X feature Auto-Sensing with automatic selection of the newly detected source and switching from the newly disconnected source via Hot Plug Detection voltage when enabled. The KD-S2x1X and KD-S4x1X are fully licensed and compatible with support of HDCP 2.2. The switchers have HDR header information included in the 4K EDID handshakes, ensuring integrators will not have to navigate through the menu of their video sources to enable optimal viewing for their systems. The KD-S2x1X and KD-S4x1X provide advanced EDID management options, with a built-in internal library with 15 EDID handshakes, including 4K with HDR in addition to native EDID data copied from the output/display. Key Digital’s proprietary Full Buffer System manages TMDS re-clocking/signal re-generation, HDCP authentication to source and display, and EDID control handshake. Deep Color is supported with ranges up to UHD/4K 30Hz 4:4:4/12 bits or 60 Hz 4:4:4/8-bit. Supported lossless compressed digital audio formats include Dolby TrueHD, Dolby Digital Plus, DTS-HD Master Audio, and Dolby Atmos. Audio signals up to 5.1 or 6.1 surround are de-embedding and output at the digital optical and analog 3.5mm stereo connectors. KD-S2x1X and KD-S4x1X HDMI switchers support all SD, HD, and VESA (VGA, SVGA, XGA, WXGA, SXGA, UXGA) up to 4096x2160p and Ultra HD/4K video standards up to 18 Gbps. Forced Hot Plug Detection enables the integrator to choose if active signal voltage is forced to the connected devices regardless of the power state of the system’s endpoints. For more information, visit www.keydigital.com.